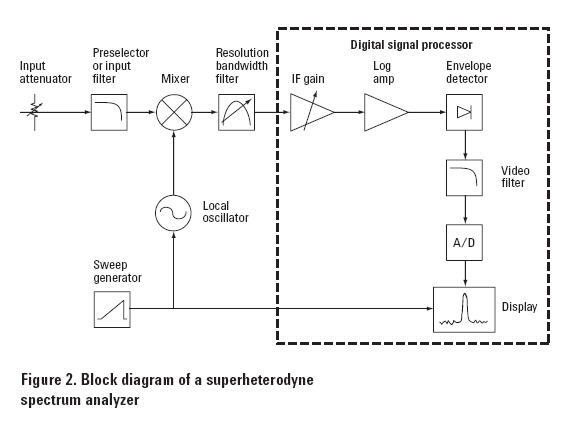 A wave analyser using the Heterodyning principle is shown in the block diagram of fig.In this,the input signal to be analysed is Heterodyned to a higher intermediate frequency (IF) by an internal local oscillator.Tuning the local oscillator transfers the various signal frequency components into the passband of the IF amplifier. The working frequency range of this instrument is from 10 KHz to 18 MHz in 18 overlapping bands chosen by the frequency range control of the local oscillator.An active filter controls the bandwidth which can be chosen at 200,1000 and 3000 Hz. The input signal is given to the instrument with the help of a probe connector which contains a unity-gain isolation amplifier.The input signal is Heterodyned in the mixer stage with the signal from a local oscillator after appropriate attenuation.Output of the mixer makes an intermediate frequency which is uniformly amplified by the 30-MHz IF amplifier.Then,this amplified IF signal is mixed again with a 30-MHz crystal oscillator signal,that causes information centered on a zero frequency.Then,an active filter with controlled bandwidth and symmetrical slopes of 72dB per octave passes the chosen components to the meter amplifier and detector circuit.The output from the meter detector can be read off a decibel calibrated scale or can be given to a recording device.